This is where you can select songs from your library and create a playlist. There are several ways to filter your song library to help you find the songs that you’re looking for. It’s important to note that, while Audio Presenter does support Apple Music, you will only have access to what’s already in your library. You will not be able to search all of Apple Music’s libary. You will need to use the iTunes and Music apps to purchase and/or add songs to your library and then you will be able to add them to a playlist. 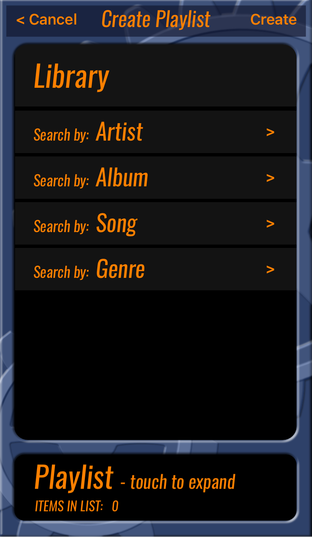 In this mode, Audio Presenter will search through your library and list each unique artist associated with each song. You can either scroll through the list to find the artist that you’re looking for, or you can enter their name or part of their name in the search filter to shorten the list to show only those artists that match your search phrase. ​When you select an artist, the view will change to show all of the albums and songs associated with the artist that you selected. In this case, “Britt Nicole” was selected and the view changed to show the albums and songs that are in the library by Britt Nicole. If you touch on an album cover, the view will change to show all of the songs in your library that are contained in that album. If your library happens to only have a subset of the songs that are actually on that album, only the songs in your library will be displayed. If you touch the “+” button displayed on the album cover, all of the songs of that album will be added to the playlist. ​If you have an Apple Music membership, and there’s a missing song that you’d like to add to a playlist, switch to Apple’s Music app and add the missing song to your library, then come back to Audio Presenter to have access to the missing song. Note that you will need to touch “< Back” and reselect the album or artist for the song to appear. To preview a song simply tap on its row. The song will continue playing until you tap on the row again, select another row, or change views. At the right end of a song row there are a couple of icons to help you know the location of a song. This means that the song is located in the cloud and will be streamed to your device. You may notice a lag before the song starts when playing back these songs during a performance. To reduce the lag, download the song to your device. This means that the song has been downloaded to your device but you have not purchased the song. Only songs that have been downloaded AND purchased will show an accurate waveform in the performance view. To purchase a song you will need to use the iTunes app to both purchase and download the song. This means that the song has been downloaded to your device and has been purchased. These songs will have the best performance and will allow accurate waveforms in the performance view which can be helpful during rehearsals. In this mode, Audio Presenter will search through your library and list each unique album associated with each song in your library. 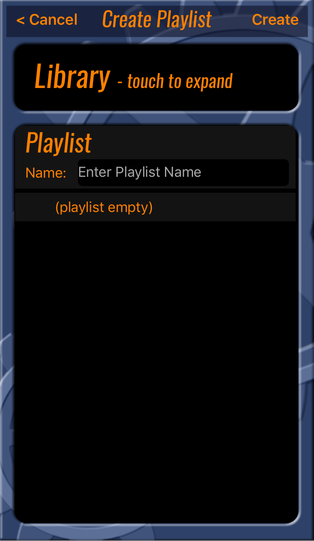 In this mode, Audio Presenter will show a list of every song in your library. It will often be necessary to use the search filter to type in a word or phrase to help you find the songs you are looking for. In this mode, Audio Presenter will search through your library and list each unique genre associated with each song in your library. When songs have been added to the playlist they will appear in the list on the right. Press this to delete an item from the list. To reorder items in the list, press and hold an item and then drag it to the place where you’d like it to appear in the list. When creating or updating playlists on an iPhone, you will switch between either having most of the screen dedicated to navigating your library or most of the screen dedicated to reviewing your playlist. To expand the playlist for review, simply touch it and it will expand. If the Library happens to be minimized, simply touch it and it will expand. As you add items to a playlist, the area at the bottom will flash briefly to confirm that you added the item. There is also a count number to help you keep track of how many items have been added to the playlist. All other details of creating playlists on an iPhone are the same as creating playlists on an iPad. Please refer to the details given for creating playlists on an iPad for more information.